Sharing the load: Ross Littlewood has been volunteering for two-and-a-half years and loves his role providing concierge support at the Mater Mothers’ Hospital. INTERNATIONAL Volunteers Day is a special day of thanks for the Mater Hospital where volunteers donate 8000 hours each month to provide support for both patients and staff. Each week more than 734 volunteer undertake shifts across 50 different roles, and Ross Littlewood is just one of them. International Volunteers Day is celebrated on December 5. 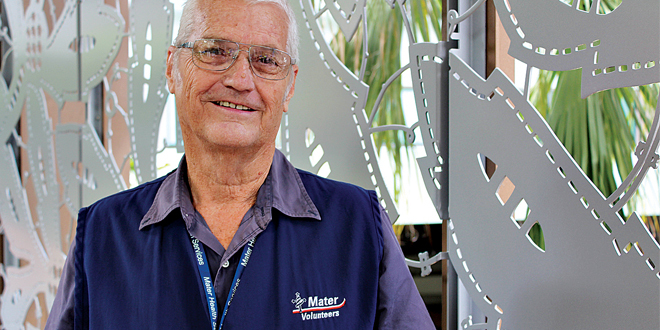 Mr Littlewood has been volunteering at Mater for two-and-a-half years and loves his role providing concierge support at the Mater Mothers’ Hospital. “My wife has been volunteering at Mater for 12 years and I started volunteering when this concierge role became available; I specifically wanted to do this role,” he said. Mr Littlewood said he got to welcome families to the Mater Mothers’ and assisted mums as they got from the car into the hospitals on their big day. He also has the joy of helping families to the car with their precious newborns when they leave for home. He said the highlight for him was seeing the families go home for the first time. “We get to take their photo and wave them off, and they really appreciate our help,” he said. “My wife and I have twin sons, so I really like to see the twins and triplets on their way home. As Mater celebrates its existing volunteers the call has gone out for a new contingent in a specialised area. The new Mater-University of Queensland Patient Volunteer program kicks off in 2016 at the Mater South Brisbane campus. The Patient Volunteer program is a teaching and learning initiative to support second-year medical students developing their clinical skills to better help patients. The hospital is calling for volunteers with a medical condition that could be explored by the students during their medical history-taking and physical examinations. The medical condition must be stable and not acute and volunteers need to be able to walk or move from a drop-off point to the lifts, and be able to get on and off an examination couch unassisted. Volunteers answering the call will attend a one-and-a-half-hour clinical coaching session on Friday morning from 9-10.30am or 11am-12.30pm at the Mater Hospital, South Brisbane. The sessions will be scheduled between February and September and volunteers will only be required for three sessions per year. To register interest phone (07) 3163 8599 or email recruitment at anna.sorensen@mater.org.au.